Left: Augmentality Labs associate Daniel Warren battles beasts in a virtual world at the Durham arcade. Right: Caleb Koller, 7, navigates the Wall Clinger at the Elevate Fitness Course. Technology — some days we can’t put it down, others we don’t even want to turn it on. No matter your (or your kid’s) preference, plenty of family fun is nearby. So switch off the TV reruns, and enjoy these long summer days. For these outings, leave devices at home, and you won’t even miss them. Hayden Koller, 11, and Caleb Koller, 7, scale an obstacle at the Elevate Fitness Course at Apex Community Park. Apex Community Park has all the essentials Western Wake residents have come to expect of the area’s top notch green spaces: athletic fields, outdoor courts, playgrounds and a 2-mile greenway. Since last summer, it’s also been home to the country’s first Elevate Fitness Course. Like it or not, technology is a part of family life. While we all enjoy the instant information and endless entertainment technology delivers, it’s all too easy for kids — and adults — to get lost in the digital world if screen time limits aren’t clearly established. Dr. Kristen Wynns, owner of Wynns Family Psychology, offers these strategies for finding a high/low technology balance. Parents can model effective “media diets” to help their children learn to be healthy in what they consume. Take an active role in children’s media education by co-viewing programs with them, checking their phones and watching the games they play. Be a good role model. Don’t check your phone at every stoplight or check Facebook every time you hear the ding. Make a media-use plan, including mealtime and bedtime curfews for media devices. Screens should be kept out of kids’ bedrooms. Limit entertainment screen time to less than one or two hours per day. In children under 2, discourage screen media exposure. Turn off screens 30 minutes to an hour before bedtime. Build a reward system. Set rules about screen times with rewards for cooperation and consequences for non-compliance. Enforce them consistently. Allow children and teens to earn more screen time on weekends and in the summer. Do chores, achieve behavioral goals, exercise or complete other requests in order to gain extra time. Keep an ongoing and evolving dialogue about technology with kids and teens as they mature. Check in with kids often and watch for warning signs of excessive screen use: social isolation, avoiding real-life problems, lying or concealing gaming time and irritability when not gaming. Interested in learning more? Check WynnsFamilyPsychology.com for dates and information about Dr. Wynns’ upcoming Tweens Teens & Screens Parenting Workshop. The obstacle-based training course, inspired by NBC’s hit competition series, is much more than traditional play equipment, with challenges that test strength, agility, balance and speed. Instructions on site describe how to complete the Lava Leap, Frog Hop and Wall Clinger, among others. 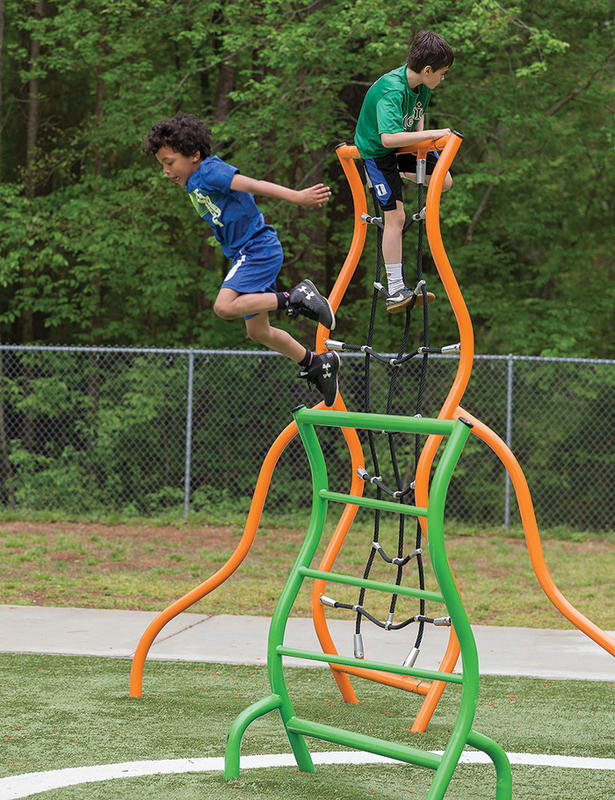 Elevate’s unique obstacles keep kids engaged and physically active, and it’s a workout for parents, too. “We didn’t realize how popular it would be,” said Brown. The Apex parks department plans to debut a ninja fitness class in its September program offerings, he said. Elevate Fitness Course is free and open to the public, and younger children can enjoy the obstacles with parental supervision. Make sure to wear closed-toed shoes suitable for climbing and jumping. Challenge your family to see who can find the most creative way through or who can finish the fastest. Kids in the kitchen might mean sticky fingers, spilled flour and clumpy dough, but it’s a great way to involve the entire family in household responsibilities. If you’re unsure how to get your children involved, Apex’s Taste Buds Kitchen will come to the rescue. 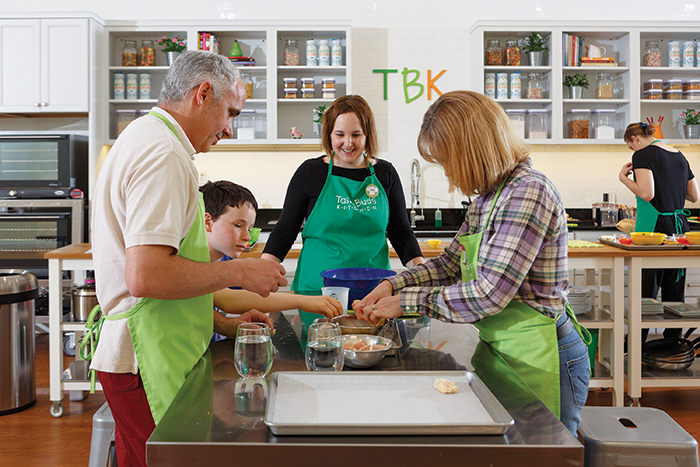 “Taste Buds Kitchen is a fully hands-on cooking studio. We make everything completely from scratch,” said owner Lisa Roche. Children as young as 2 years old can take a cooking class with a caregiver. Options for the entire family are offered starting at age 9. “We find that it’s important to get the kids into the kitchen to familiarize themselves with equipment … and they have their caregiver as their sous chef to help them,” Roche said. Each child gets his or her own set of ingredients so there’s no competition for mixing and pouring among siblings. Cupcake classes are always popular, said Roche, but plenty of other family offerings are available for air-conditioned fun. Upcoming workshops include gingerbread beach house decorating, a Father’s Day pizza party and a handmade pasta course. and Kathy Danna in a class on Chinese cooking at the Apex store. 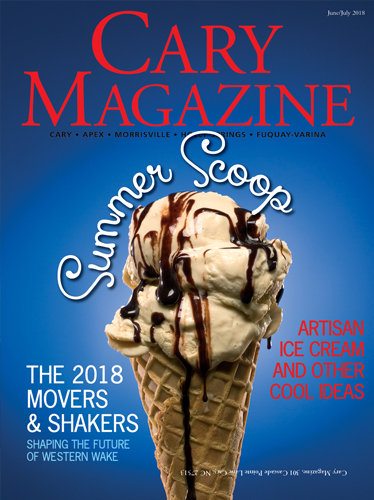 Another tech-free option is a day of “quiet camaraderie” on the waters of Lake Crabtree, suggests Park Manager Drew Cade. The lake allows only non-motorized watercraft, so it’s perfect for a low-and-slow outing that’s entirely screen-free. For a mere $7 per hour, guests can rent canoes, kayaks and the increasingly popular stand-up paddleboards. Rentals include a personal floatation device and the necessary paddles or oars. The facility currently has six stand-up paddleboards and is looking to add more to meet demand. “If you’re stable on a canoe or kayak, you can stand on a board,” Cade said, citing Lake Crabtree’s wake-free water as a great place for an inaugural SUP session. “Being elevated above the water provides a different experience. It’s a very relaxing thing,” he said. Best suited for families with teenagers or college students, Lake Crabtree allows only one person per board with a minimum age of 16. However, REI and Great Outdoor Provision Co., host clinics during June with a larger variety of craft available, including some that may be appropriate for younger ages. Families with small children might consider a double kayak or a canoe to explore the lake. Make sure to pick up Lake Crabtree’s paddling brochure, which features a 10-point trail highlighting natural and manmade features in the park. Video games and smartphones don’t have to be isolating with these interactive alternatives. Impress even the most tech-savvy youngsters with a trip to Augmentality Labs, a virtual reality arcade less than 30 minutes from downtown Cary. The year-old business is the first VR arcade in the Triangle and offers a technology experience that most guests have never encountered. 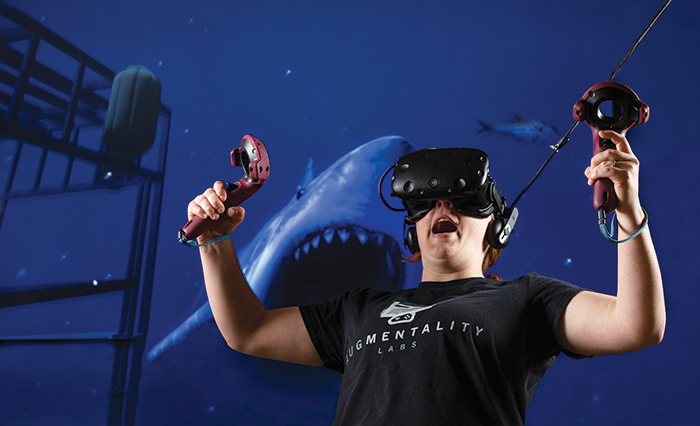 Augmentality Labs co-founder Alicia Hetrick experiences a virtual world playing an undersea game at the Durham game center. 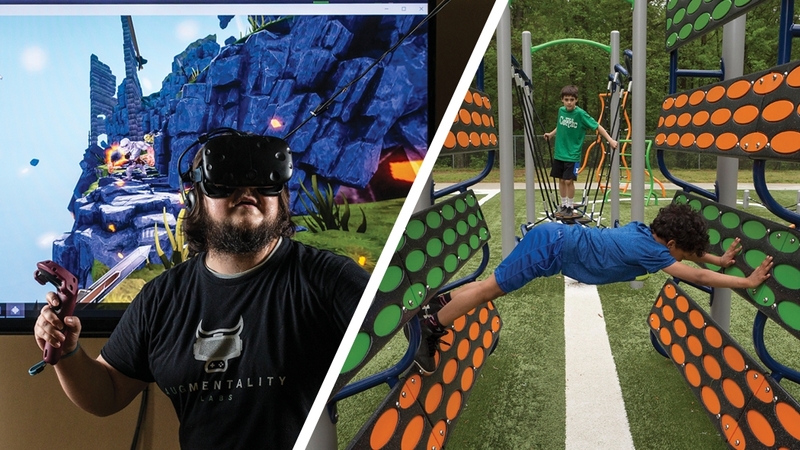 Geared toward ages 8 and older, Augmentality Labs offers dozens of game choices including sports, first-person shooters, arcade-style games, multiplayer experiences and lifestyle adventures like swimming with the dolphins or exploring historical landmarks. Parents and children, even those who don’t consider themselves gamers, can still enjoy the virtual reality experience. “We have a comfortable space set up where you can laugh at those in the headsets waving their arms around wildly, see a first-person view of the headsets on attached TVs and play retro and board games while in between sessions,” Hetrick said. Sessions start at 30 minutes. Adjacent VR stations can be booked together, so groups can play next to each other. Stop-motion animation techniques have been used in filmmaking for more than 100 years. Notable recent examples include “The Nightmare Before Christmas,” “Wallace & Gromit: The Curse of the Were-Rabbit,” “Chicken Run” and “The LEGO Movie.” Budding videographers can now create their own movies with nothing but a smartphone and a free app. To get started, you’ll need to download a stop-motion animation app. Check out Stop Motion Studio for Apple devices or Clayframes for Android phones. Both have free versions for beginners and upgrade options for a few dollars. Next, brainstorm an idea involving objects or toys from around the house. Possibilities include building with blocks, a stuffed-animal parade, a LEGO character adventure or drawing a picture. It takes dozens of images to create a few seconds of film, so start simple until you get a feel for the technology and patience required. 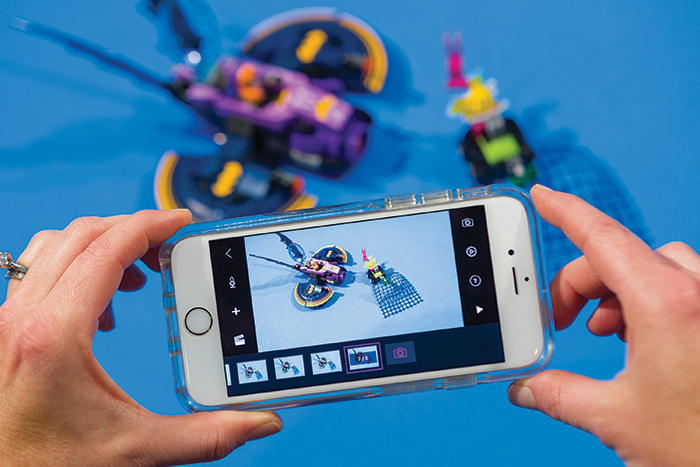 Make your own rendition of “The Lego Movie” with a smartphone and an animation app like Stop Motion Studio for iPhone. Position your objects on your desired background, then launch your app to start taking the photos. Move each piece incrementally in between each photo for the smoothest transition. Features in the apps allow you to add sound, backgrounds and rearrange frames. If your app contains an “onion skin” control, use it to view transparent overlays of previous frames and position your camera more precisely frame to frame. Preschool and elementary ages will enjoy creating the story and moving the objects, but will need help from a parent or sibling to control the camera. Middle- and high-schoolers will be able to dive deeper into the app’s features and execute without much assistance. Of course, everyone loves to see their finished project dance across the screen. If the Scrabble board elicits eye rolls from your family, then it may be time to turn game night high tech. Playing video games together can be as rewarding for family bonding as traditional board games, and even more so when the children get to lead the activity with their own digital favorites. “Most kids and teens are passionate about their online and gaming worlds,” said Dr. Kristen Wynns, owner of Wynns Family Psychology. Playing video games side by side allows parents to connect with children over something that’s often divisive and to be seen as playmates instead of Mom and Dad. “I encourage parents to ‘play dumb’ and ask to be taught how to play a certain game or to use a certain social media app. Kids and teens like to feel as if they are experts, and teaching parents can be an easy way to bond,” said Wynns. Set rules for time limits beforehand, so everyone gets a fair turn. Keep the mood upbeat and casual — video games can get serious fast — the goal is connection, not (too much) competition. Music games like Guitar Hero or Rock Band make great choices since the family works together while jamming to favorite songs. Dancing games such as Just Dance keep everyone active and give spectators a great chance for giggles. Sketch Party TV, a drawing and guessing game similar to Pictionary that’s played through Apple TV with an iPhone or iPad. Knowledge is Power, a game show trivia quiz that pits contestants against each other to reach the top of the knowledge pyramid. Available on PlayStation PS4. Beasts of Balance, a stacking game that lives partly on your tabletop and the rest on screen. Build towers of animals in reverse Jenga style, and watch your digital world grow with the height of your tower.